The stark truth is that very few ‘rules’ exist today in the field of resume writing. Unbreakable rules include: you can’t lie, you can’t have spelling errors and you can’t include negative information. In reality, there’s no universal answer on how long your resume should be. In this article, we’ve listed guidelines for you to figure out the ideal resume length for your unique situation. How Many Pages is Too Many for Resume? For University students or school leavers, it’s ideal to keep your resume to one page. However, even as a Year 12 graduate or a College student, you might have had many relevant internships, retail jobs, extracurricular activities, academic projects or transferrable skills that would merit expanding your resume to two pages. This is fine, but make sure to include only the relevant information. Just because you have a two-page resume doesn’t mean you need to include all two pages in every job application. For each job, carefully read through the requirements, adding or omitting elements of your resume so you’ll have a resume that’s tailored to the specific job ad. For professionals and mid-level managers, you simply couldn’t squeeze your numerous experience and skills to a single page. Two to three-page resume is recommended as this will allow you to have enough space to include all relevant information and work history, while still making your resume readable. Executives and senior-level managers often have a long list of achievements and experiences that they have to include. The same is true for individuals in the sciences, medical and legal fields, and academia who want to include their placements, internships, awards, licenses, patents, presentation, publications or even affiliations. Job seekers in the engineering and IT sectors might also want to include their technical proficiencies, different contacts and list of projects managed. These job seekers can write a resume that is three to four pages long (or even up to five pages). Resume length is only important when you submit a ‘print’ copy of your resume or when you’re emailing your resume as an attachment where it is intended to be read by a person, not by the ATS (Applicant Tracking System). When you apply online, your resume is typically run through an ATS, which scans for keywords. In this case, page length becomes unimportant since an ATS will still scan your resume regardless of its length. However, you can never be sure if a company uses an ATS or not, so it’s still advisable to keep your resume concise. Be aware as well as almost every recruiter will check you on LinkedIn. LinkedIn complements your resume so in case you still don’t have a LinkedIn profile, consider creating one. Information that are not too relevant to the position you’re trying to apply for are better left off in your LinkedIn profile. The rule of thumb is that any experience past ten years is no longer relevant and should be kept off a resume. Though this rule doesn’t apply to all job seekers. If the experience is still applicable to your next career move, regardless of when it occurred, it should still be included on your resume. When it comes to placing your old work experience on your resume, focus on relevancy of information. If you did something ten years ago that is more relevant to what you’re trying to do than other recent experiences, then you absolutely should include it because it adds to your qualifications. When you’re trying to make a two-page resume but your information overflow onto a second page, there are many ways to condense your resume. First, change the font of your resume (example: if you’re using 11-point font, try a 10.5-point font). Try to make your headings slightly smaller as well. However, you probably still want your headings to be slightly larger that the rest of the text. You can also play with the spacing of your resume. For instance, if you have two spaces between each heading, try cutting this to one space between each heading. You might also want to change the style of the words. For example, bold words take up more space than italicised words. Try changing anything in bold to italics. You might try reducing the margins a bit, but don’t make them smaller than 0.5 inch. You might want to make sure you keep enough white space on you resume too – meaning neither too condensed nor with too much white space. The key is to fill all, or at least three quarters of every page with relevant and helpful information so that recruiter’s attention is not drawn to the blank space on each page. Click here for a sample two-page resume. 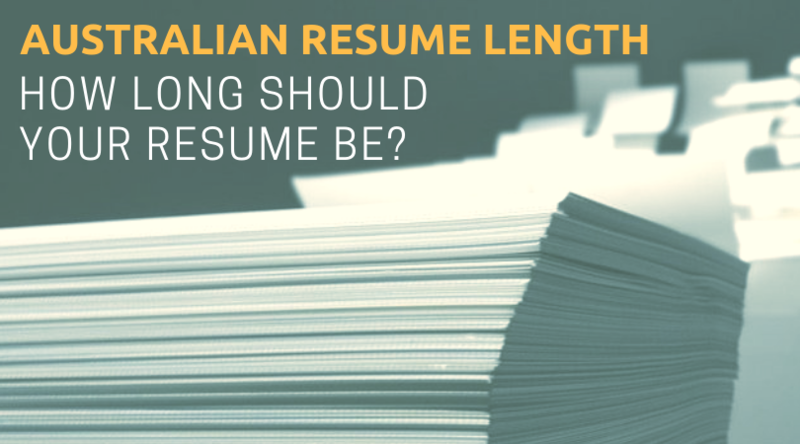 The latest trend in Australian resume length indicates a prevalence of two page resumes. This is because plenty of information on job seekers is already easily accessible online these days. Despite that, no one can really dictate how long should your resume be. Don’t be afraid of leaving out certain info. The key to securing a job interview invitation is to grab the recruiter’s attention. So, try to be as concise as possible, and you can always mention all the details to the recruiter in person or supplement your resume with a LinkedIn profile. Click here for more job search tips and advice. Or check out the Top 50 Resume Writing Blogs here. For more ideas on how to craft winning resume, visit www.rev-upyourresume.com.au or connect with us through LinkedIn, Twitter, and Facebook.